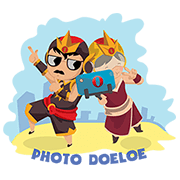 http://www.line-stickers.com/ – Tora – The Gatot Kaca Opera Line Sticker | Express more with fun Tora – The Gatot Kaca Opera stickers! Friend Opera Browser IDʹs official account to get the stickers. Available till March 25, 2015. Previous post Uchao by H.I.S.